According to a new report on electoral reform from the Broadbent Institute, nine million out of the 17.5 million votes cast during the last election “effectively didn’t matter” thanks to Canada’s out-of-date first-past-the-post electoral system. 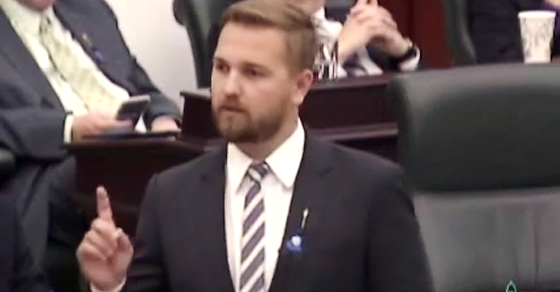 That’s a number of votes so large it’s equal to the entire populations of Alberta, Saskatchewan, Manitoba and all the Maritime provinces combined – and those “wasted” votes cut across all party lines. 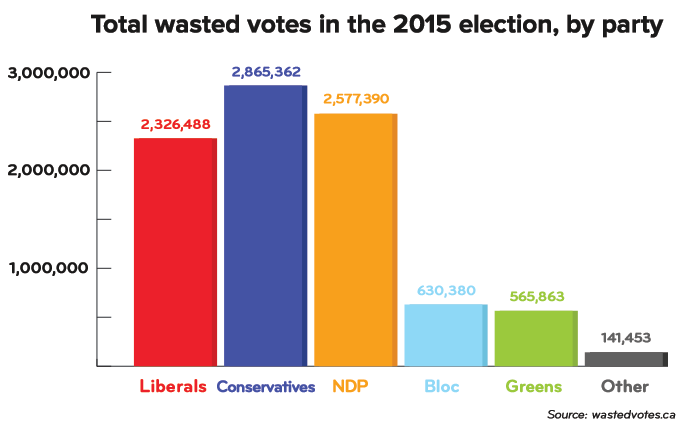 Conservative voters were the biggest losers under first-past-the-post, with over 2.8 million wasted votes during the 2015 election. 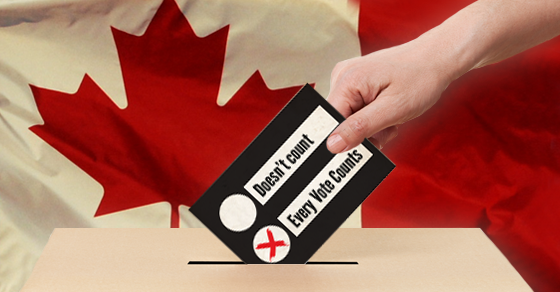 Under the first-past-the-post system, people in each riding cast votes for the candidate of their choice. Each riding’s representative is selected on a winner-takes-all basis, even if the majority of voters in the riding supported somebody else. When you add it all up, what you get is a Parliament that does not accurately represent how the electorate really voted. 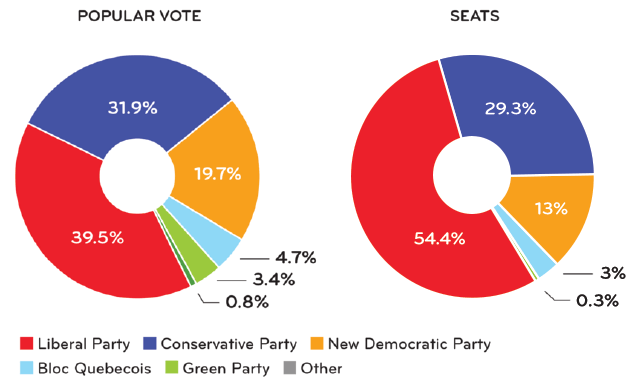 In 2015, the Liberals won a majority government with 184 seats (or 54% of Parliament’s 338 seats) even though they only received 39.5% of the vote. But this is no fluke of the 2015 election. 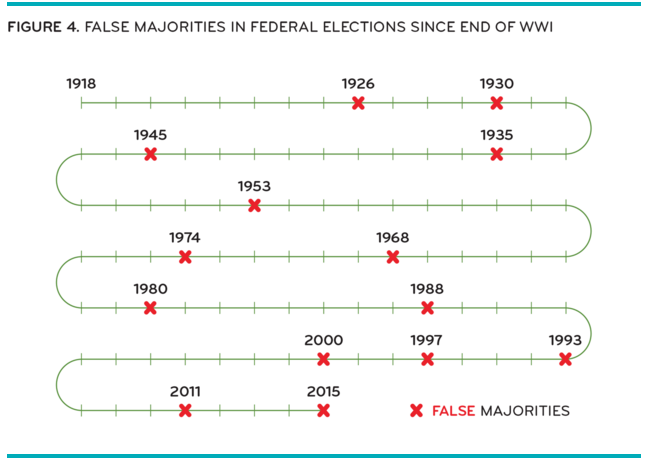 Since the end of the First World War, 14 of Canada’s 18 majority governments have seen the winning party form government even though they did not receive a majority of the popular vote. And 2015 was far from the most distorted outcome. Although first-past-the-post has produced many strange outcomes, the 1993 federal election might be the weirdest, with Jean Chretien’s Liberals forming a majority government with 41% of the vote and 177 seats. The Progressive Conservatives, who had previously been in government, were reduced to two seats despite winning 16% of the vote and the Bloc Quebecois became Official Opposition with 54 seats, despite receiving 13.5% of the vote. Poor Preston Manning – Manning’s Reform Party was was three seats shy of becoming Official Opposition, even though they received 18.7% of the vote, which is 5.2% votes more than the Bloc Quebecois received. Photo: Ankakay. Used under Creative Commons license. "I find these debates stale." As Alberta schools prepare to implement new LGBTQ guidelines in accordance with Bill 10, passed last year by the previous PC government with support from all parties, Fildebrandt tweeted Tuesday morning that he finds “social issues” a touch too “stale” for his tastes.